As long as the polymer clay is cluttering up my table this week, I decided to play with it a little more. I've made a few more polymer clay molds and made more polymer clay Thai Buddhist amulets, but the excitement is wearing off. Apparently one lifetime making amulets was enough for me. 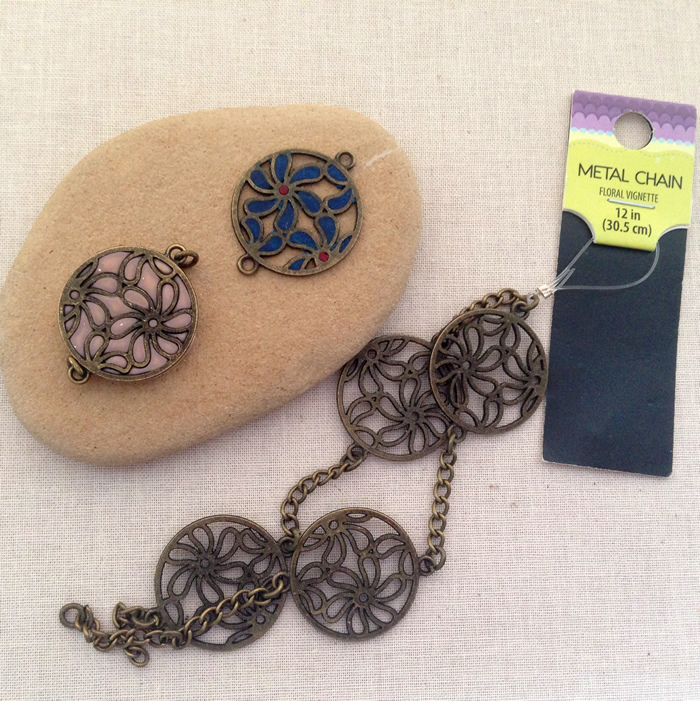 I noticed this great metal chain with flower medallions in my stash and the lightbulb went on. 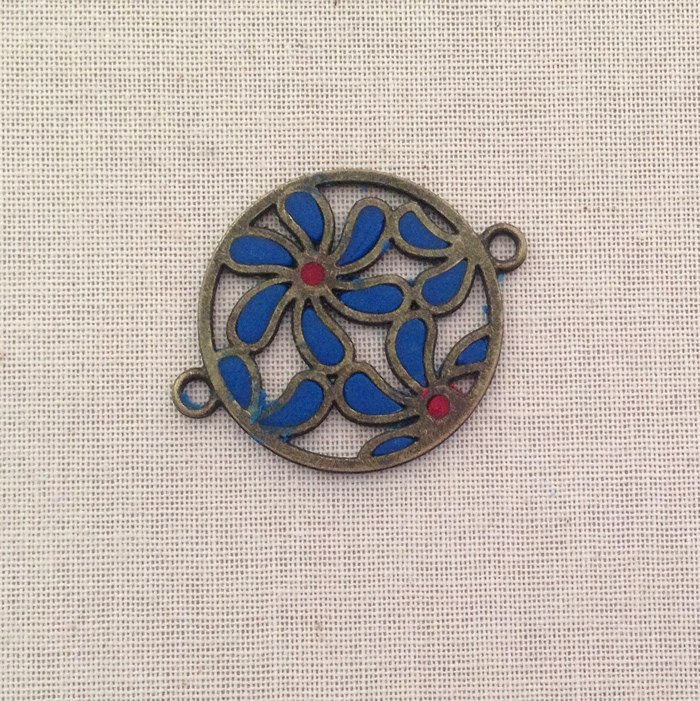 How fab would that look with some polymer clay inset into it? 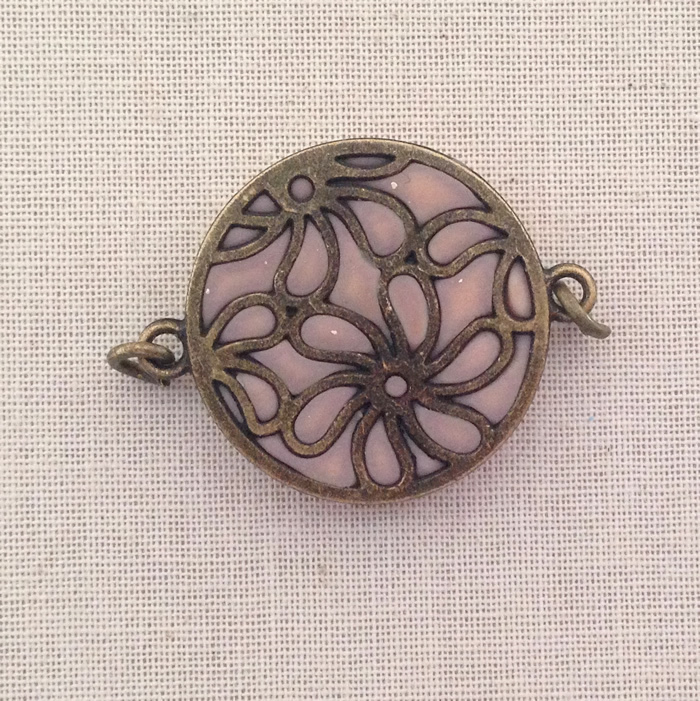 Well, my first attempt is this peachy pink solid pendant. I just rolled a flat coin of polymer and pressed the wire pendant into the clay, trimmed the edges nice and neat and baked. I think the biggest problem with it is that the clay is probably slightly burned, causing it to discolor a little near the wire. I baked it at the same temperature and the same amount of time as the amulets - and with the inset wire, it probably got too hot. 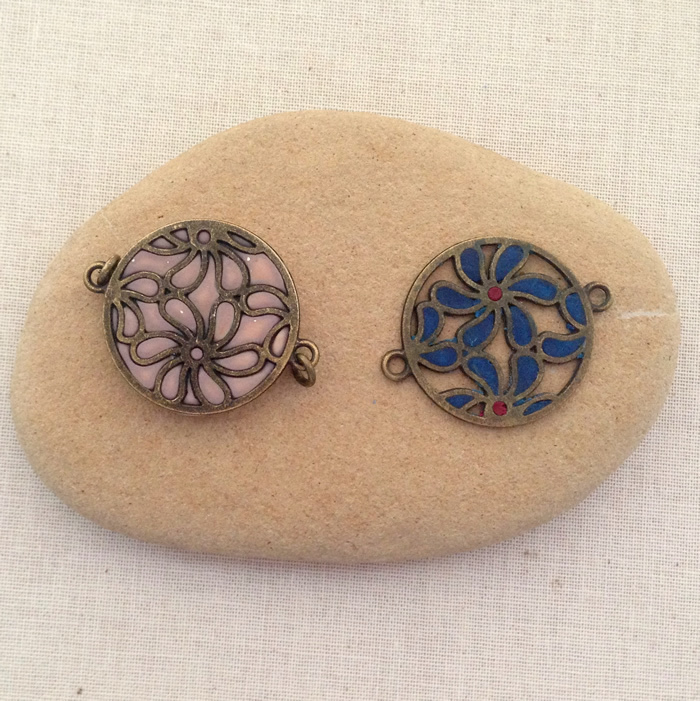 It's still pretty interesting though - and better then the flower pendants without the inset. They don't stand out very well on their own. For my next version, I decided to be meticulous and push tiny balls of clay into the flower petals to simulate enamel cloisonné. It really wasn't very difficult or time consuming, but there were a few tricks. It was better to slightly overfill each section than underfill. The technique is a push and shmear to fill the area and swipe away the excess. You can use a toothpick or needle to scrape out the overfill or stray areas. 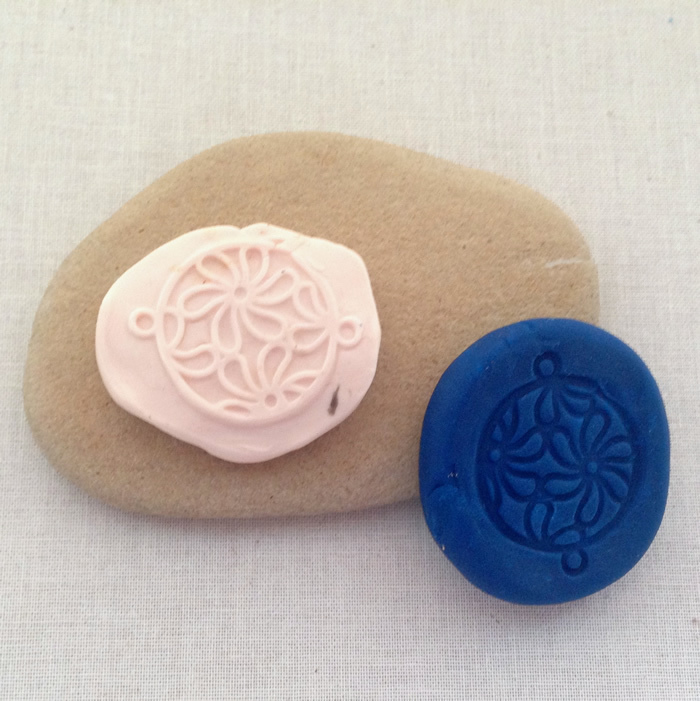 And you must keep the pendant pressed flat against a smooth surface because you are working on the back side. Also, that smooth surface should NOT be your kitchen counter or anything you care about because polymer clay leaches an oily substance when it sits for any significant amount of time on any absorbent surface. This is the front side of my pendant after baking. Pretty cool - eh? Actually, I think they both came out pretty good. 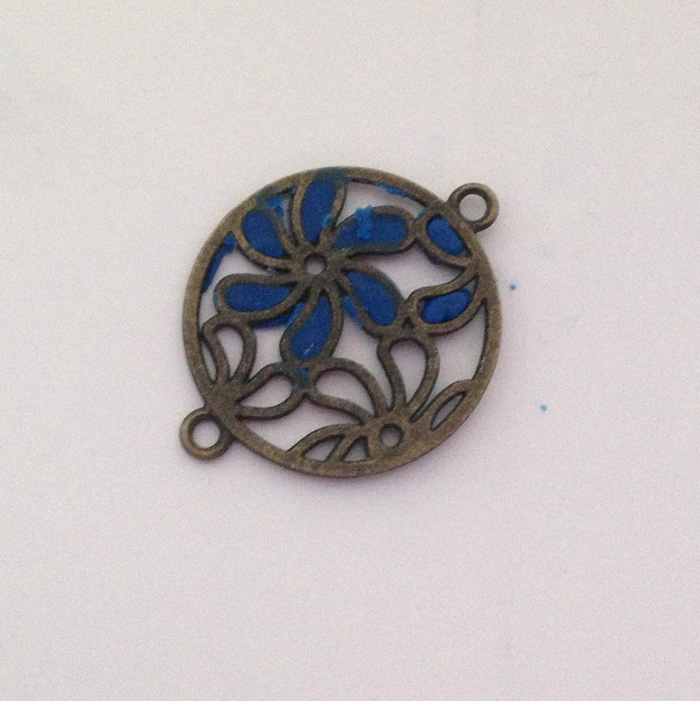 I baked the blue pendant for only 15 mins at 200 degrees F. It seems fully cured and I don't see any discoloration. After baking, you can still pick the pieces of polymer overflow out of the crevices. And here's my other experiment - while I was baking, I decided to press a wire flower pendant into another piece of clay and make a mold. I wasn't really sure what to expect from it, but the imprint on the light piece of clay is the result. It won't be possible to trim it to an open work pendant, but I think it still may be interesting with other colors or clay pressed into the petals. 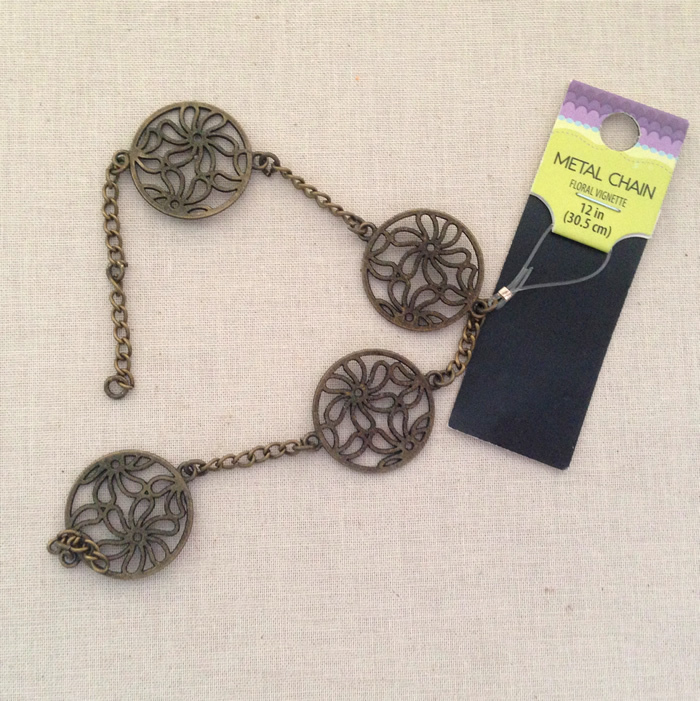 If you are interested in trying this, the metal chain with the flower medallions shouldn't be too hard to find. I'm pretty sure it is from Michaels or Joanns in the chain section. I have a couple of other styles of it too. I'm very happy to say a few kind souls have decided to follow me on some sort of social media. It makes me feel all warm and fuzzy inside when you do. How fun. Thank you for sharing Lisa. I'm not a nail polish fan because it chips or yellows over time. I usually use a coat of acrylic paint, the gloss finish made by polymer clay companies (I think Fimo makes one) or modge podge - who now has a huge line from matte to sparkle to a doming one that looks like resin. I actually put that one on the pinkish colored one last night to see if it made it pop better.